This Poole traditional amber leaded stained glass outdoor wall lantern is rated IP43 and features a handmade square section lantern, made from clear, frosted and rippled water glass, with a amber highlighted window on each panel. 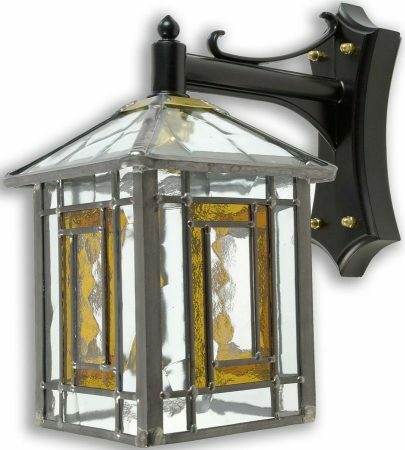 A wonderful lantern, with shaped iron work wall mount and scrolled detail that gives a wonderful warm light. What could be more enchanting than this traditional handmade outside wall mounted lantern? Also available with green, red or blue highlights; please contact us to enquire about these options. Hand crafted in Yorkshire and featuring traditional soldering techniques, this Poole traditional amber leaded stained glass outdoor wall lantern embodies over seventy-years of skilled local craftsmanship. Please could you advise from what metal this light is made? I am just concerned about the metalwork rusting. Thanks, Mike.